All three titles in one volume! The search is on for a new king or queen. 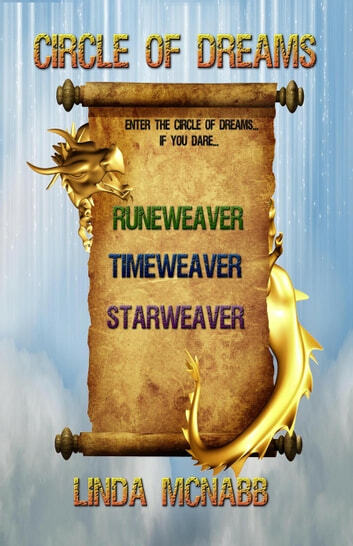 The search is also on for runeweavers who can help contenders penetrate the Circle of Dreams and win the throne. Zaine couldn't have chosen a more perilous time to discover his fate. For runeweavers must take centre stage in the battle for the new monarch. He is destined to play a unique and dangerous role – to fulfil a prophecy that could spell great danger, and even death, for young Zaine. Zaine felt numbed by the book's similarity to his own life-reading. She came from another world and had been alive for a very long time. How could their life-readings be so similar? The quest for the new king or queen in the Circle of Dreams has ended in disaster. The circle is destroyed and a fury of storm dragons has been released, determined to wreak vengeful havoc on the world. Young runeweaver Zaine is blamed for the catastrophe, so it is up to him to battle against time and the dragons to restore peace. On his quest, Zaine meets a girl whose fate seems eerily like his own. Their lives appear mirror images of one another: two circles, two destinies, and now only two possible outcomes – death or life. Zaine has more than enough advice, and a jumble of new, mysterious runes that may help if he can unlock their secrets. The only thing he does not have is time – and time is what he needs most! "Say the runes in this order, without pausing." Zaine tensed. If he got it wrong, the entire world would shatter. He tried to tell himself that the world didn't have much longer anyway; and even if he failed it would be better than time just stopping - wouldn't it? After a long period of disruption Willow Castle has been rebuilt, and the country's ruler seems to have been chosen. But now the days seem unnaturally long. When the sky fills with shooting stars Princess Guyan provides the chilling answer - time is slowing down and will soon come to a complete standstill.